Three people are certifiably insane. Kris and Zero are probably lost causes, but Nate, I sense it's not too late for you. For the sake of your self and those around you I implore you to seek professional help immediately. Ocarina is good, but A Link to the Past is the best game of all time. @Shadowlink Sorry I like tight, continually awesome experiences not big open boring fields. I like Ocarina, but it felt like it was lacking something compared to LttP. But both are amazing games, so really everyone wins. No contest. Keep your big, boring fields and goofy polygons. I always tell everyone Lou is good people. But both are amazing games, so really everyone wins. But in another more accurate way, Ocarina is the winner. Where you chumps see a boring field, I see a vista of endless possibilites. For the sake of doing something different, I would have contemplated voting for another game over OoT depending on the matchup. Unfortunately, the board voted off Metroid Prime in favor of a clearly inferior Zelda game. You can't make me choose. I can't compare the two, they're too different, so I chose the one that had a larger impact. That's exactly how I feel. I love both games equally, but Ocarina was much more impressive at the time. It's same as comparing Mario World to Mario 64. I really wish more people played Chrono Trigger. Like, some people say "BEST GAME EVER" for a lot of stuff...but Chrono Trigger IS the BEST RPG EVER. Yeah, Ocarina of Time is tough sledding, but..man. 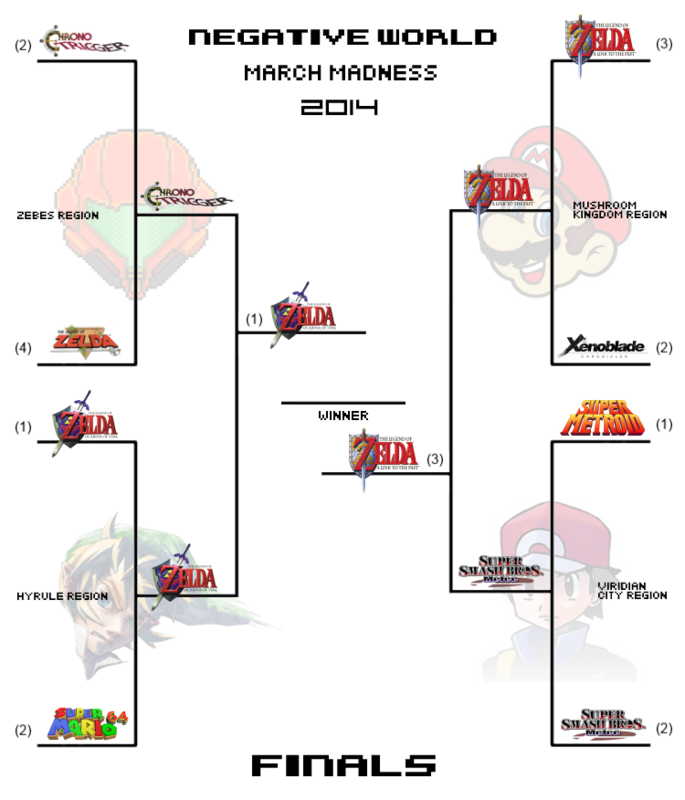 I would've taken Monster Hunter Tri / 3 U and Final Fantasy III("VI") over Ocarina as well. I guess we gotta focus on how to get that stuff to the finish. I've played Chrono Trigger. It's good, but it's no Ocarina. Yeah, then you'll see all of the occasional rocks scattered around. Well, the advantage OoT (and LttP at most places to) has is that pretty much everyone HAS played it, and it's universally popular. I'm sure plenty of us who've voted OoT would put some other game ahead of it, but it is generally seen as a consistently beloved game. Not unlike CT, actually, which gets tons of love on the internet already. Personally, I'd put four games above Ocarina (including--from its own series--Zelda 1), but I have no problem with it winning this thing. It's true that a bunch of Zelda and Mario at the end is fairly predictable, but there's a reason those games are universally played in the first place; they're pretty accessible and very well-crafted in general. As much as I wanted Zelda 1 or Final Fantasy 3 to go further, they typically aren't as super-popular as their big brothers (or cousin, in the case of FF3/CT).